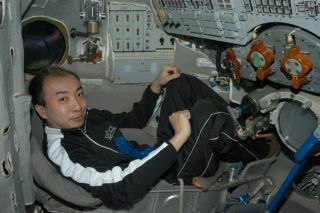 Space tourist-to-be Daisuke "Dice-K" Enomoto of Japan sits inside a Russian Soyuz TMA spacecraft simulator. Enomoto is set to ride the Soyuz TMA-9 spacecraft to the International Space Station in September with the Expedition 14 crew. Japan'sfirst tourist slated to fly in Earth orbit has received a clean bill ofhealth from Russia's Federal Space Agency to train for a planned September spaceflight, theSpace Adventures tourism firm said Monday. Russia'sGovernment Medical Committee found Daisuke "Dice-K"Enomoto, a 34-year-old Japanese entrepreneur, fit for training and the finalcontract for his 10-day spaceflight has been signed, according to the Arlington,Virginia-based Space Adventures, which brokered the trip. Enomoto istaking Russian language courses and is immersed in the first phase of hiscosmonaut training, Space Adventures spokesperson Stacey Tearne told SPACE.com.Of his 10 days in Earth orbit, about eight of them will be aboard theInternational Space Station (ISS), she added. Slated tolaunch toward the ISS this September with the station's Expedition 14 crew,Enomoto is the fourth paying visitor bound for Earth orbit. His planned flightfollows the ground-breaking launch of U.S. entrepreneur Dennis Tito in 2001, South African Mark Shuttleworth's 2002 spaceflight, and the2005 mission of U.S. scientist and businessman GregoryOlsen. SpaceAdventures helped arrange all three of the previous flights, each with a reportedprice of about $20 million, aboard Russia's robust, three-person Soyuz TMAspacecraft. Enomoto and the Expedition 14 crew will launch aboard the SoyuzTMA-9 vehicle, the space tourism firm said. "We lookforward to his launch in September when his dream of spaceflight will berealized and we hope and trust that he will be an inspirationto others around the world to pursue their own dreams of spaceflight," saidEric Anderson, Space Adventures CEO, of Enomoto in a statement. Enomotocurrently resides in Hong Kong and works as an independent investor. He previouslyserved as executive vice president and chief strategic officer for theinformation technology firm Livedoor, and founded the website DICE-K.com. In additionto brokering orbital space treks with wealthy individuals, Space Adventuresalso offers airplane flights that simulate weightlessness and rides aboardRussian MiG jets. The firm has also announced plans to offer $100 millionflights to circle theMoon, as well its intentions to construct a fleet of suborbital rocketshipsfor launch from future spaceports in Singaporeand the UnitedArab Emirates.